While the Jews and Christians were fiercely antagonistic to Mesopotamian civilization, I can think of a number of reasons why they were also deeply influenced by it. i. Many of our most basic concepts — such as numbers (base ten and base sixty, the length of a second, the degree of a circle, etc. ), writing, legal codes, cities, and religion — take their earliest forms in Sumer, and are from there passed on to the civilizations of Akkad, Babylon, and Assyria. While language doesn't determine the structure of religious belief, it determines the expression of perception, feeling, and thought. Even if we disagree with a concept from a parent or sister language, we see this concept in terms of a very similar language structure. The articulation of our disagreement is likewise couched in the same nexus of language, thought, emotion, and culture. "Neo-Assyrian clay tablet. Epic of Gilgamesh, Tablet 11: Story of the Flood. Known as the "Flood Tablet" From the Library of Ashurbanipal, 7th century BC." From Wikimedia Commons. Some argue that the Mesopotamian versions corroborate the biblical narrative, yet I think that they have the opposite effect: they suggest that the Jews borrowed this story A) without acknowledging its source or B) without being aware of its source. I don't pretend to be an expert in this complex area, yet I'd like to explore several reasons why the biblical versions might highlight the debt owed to Mesopotamia. I'll couch these in terms of objections and counter-arguments. One could object that the Mesopotamian and Jewish versions came from the same series of events but were transmitted separately, one in a polytheistic and another in a monotheistic context. Yet concrete evidence of the Mesopotamian story goes back far earlier than any evidence of the Jewish story. 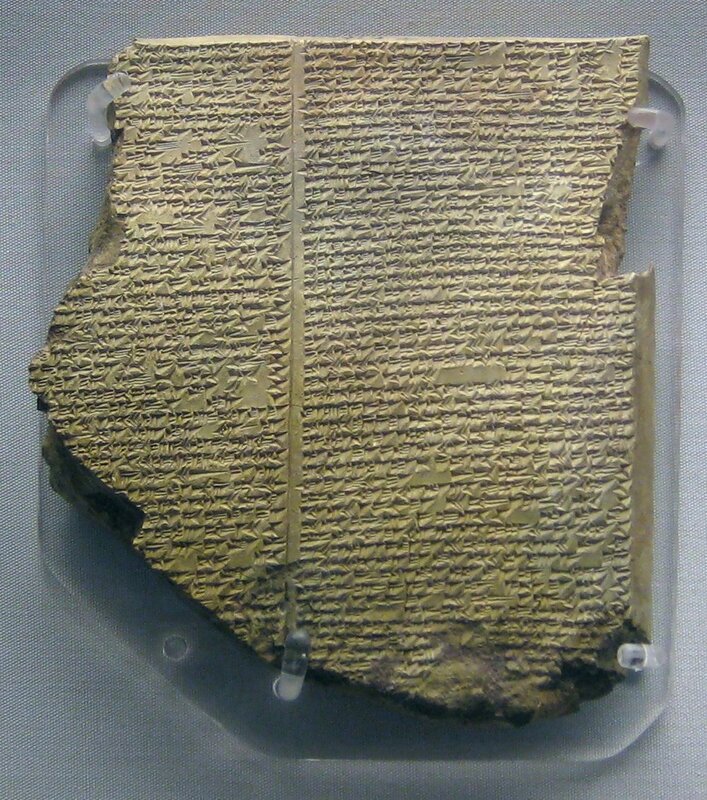 The standard full version of the Epic of Gilgamesh includes the flood story in detail and was written at the end of the second millennium by the priest Sin-lique-unninni. This 12-tablet version of Gilgamesh combines and alters elements of previous versions. This version is also extant, that is, it still exists. It can be directly verified. Earlier versions of the same flood story can be found in the Akkadian Atra-Hasis and in the Sumerian Eridu Genesis, both of which can be found on fragments dating from about 1600 BC. 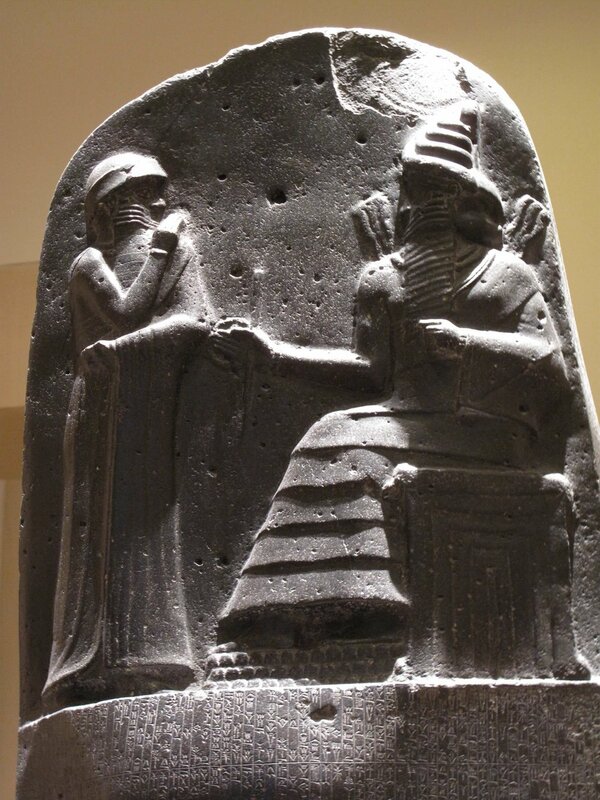 There are also numerous cuneiform fragments which corroborate the popularity of the Gilgamesh and Flood stories, and many scholars believe that Gilgamesh was probably a real king who ruled in the early third millennium. 3) the earliest extant biblical record can be found in the Dead Sea scrolls, which date from around 300 BC. In regard to 2) above — the lack of historical evidence for early biblical events — archaeologists, Assyriologists and Egyptologists haven't found evidence of early biblical figures or events (by which I mean those found in the Torah or Pentateuch, i.e., Genesis, Exodus, Leviticus, Numbers, and Deuteronomy). The well-publicized theories of David Rohl, which try to match biblical and archaeological records, aren't accepted by most scholars. Rohl tries to verify Jewish history by placing the exodus earlier in the second millennium or — more controversially — by shifting forward the dates of the Middle Kingdom (2055-1650 BC) and the New Kingdom (1550-1069 BC). My point here isn't so much that the Torah lacks historical evidence (which it seems to) as that the monotheistic flood narrative in the Torah lacks early, pre-Classical textual evidence. Even if one were to verify the story of the Exodus (within the conventional timeframe or by changing Egyptian chronology), this would still have little bearing on the origin of the Noah narrative. Noah's Ark, by Leopold Layer (1752–1828), Slovenščina: Vesoljni potop in Noetova barka. From Wikimedia Commons. As far as we can tell, Mesopotamian writers didn't borrow from Jewish stories about Yahweh and Noah, yet the legendary Moses (the traditional author of the Torah) borrowed from the Mesopotamian story about Enlil and Utnapishtim. My question isn't so much, Did Moses ever live in Egypt? as Why would Moses, supposedly brought up in Egypt, write like a Babylonian? Even if we dispense with the unlikely idea that Moses wrote the Torah (most scholars see four historical layers in its writing), we are still left with the question, Why didn't the authors of the Torah know about or acknowledge the previous account of the Flood? In regard to 3) above — that is, to the lack of early Jewish versions of the Bible stories — one could object that the Jews may have written on papyrus scrolls or parchment documents at a date much earlier than the Dead Sea scrolls (Egyptian papyrus and parchment go back to the 26th and 24th centuries BC). These early writings may have decomposed while the more durable clay cuneiform tablets survived. This argument could also be applied to original Jewish accounts of the Flood that were handed down orally. Yet in either case we have no concrete proof and we have no outside corroborating evidence. If, in the future, archaeologists find a third millennium BC monotheistic version of the flood story deep beneath an Egyptian pyramid, or in some obscure sunken room of the famous library of Ninevah, then we could argue that the polytheistic story was a take on the monotheistic one. Yet so far it seems the other way around. This doesn't mean that the extermination-warning-flood-boat-survival-bird-mountain-sacrifice-blessing story can't have an even more distant source, oral or written. Yet given that we presently believe Mesopotamia to be the birthplace of writing, it's unlikely that it would be written down in a language that pre-dated Sumerian.